The Challenge: Greenhill School wanted to find a way to hold tuition prices down in order to continue to attract a diverse student body. They hired Measuring Success to use data analytics for benchmarking, surveys and a top-to-bottom financial review. The Deliverables: Measuring Success provided briefing books and dashboards so that all participants in the working groups could have access to the data before and after scheduled meetings. 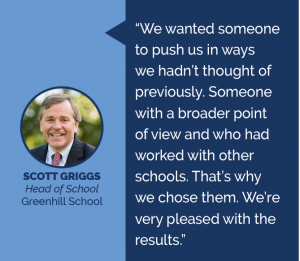 The Approach: Measuring Success used data to compare Greenhill to other schools. How could they remain competitive in areas like faculty compensation, academic preparedness and facilities spending while keeping tuition pricing, which has a compounding nature, low.